15 times we saw grooms playing the role of a 'bridesmaid' on their wedding day! There is nothing better than having a best friend in your husband-to-be! 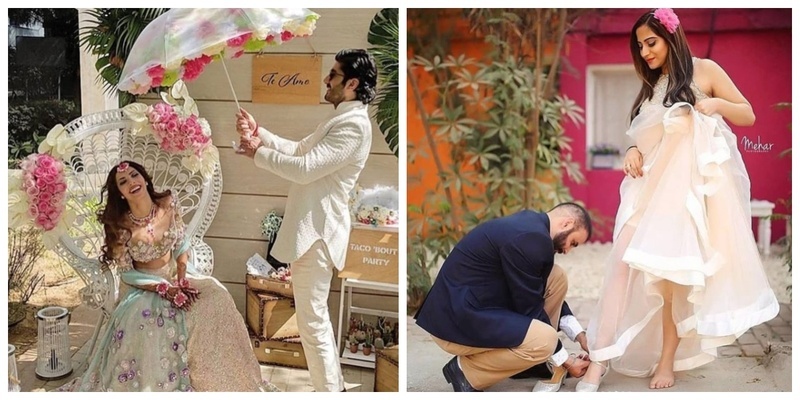 We spotted the cutest of couple moments in weddings where the groom was seen playing the ‘bridesmaid’ for the bride. 1. The groom who gave his bride's Mehndi a try! 3. The groom who doesn't let the sultry heat touch his bride! 5. The pastel pink coordinated groom helping in fixing his bride's heel! 6. The groom who didn't let his bride make an effort to wear her payal! 7. The groom who let his bride wear her perfect matching sandals without her bending at all! 10. ‘The perfect touch up’ groom! 11. With his shoulder to cry on, and his knees to tie your payal, what else do you need? 12. The groom who never left his bride in the scorching heat! 13. The groom who would never leave the hand of his bride! 14. The groom who ensures his bride's healthy diet! So how's your groom gonna get captured helping you?